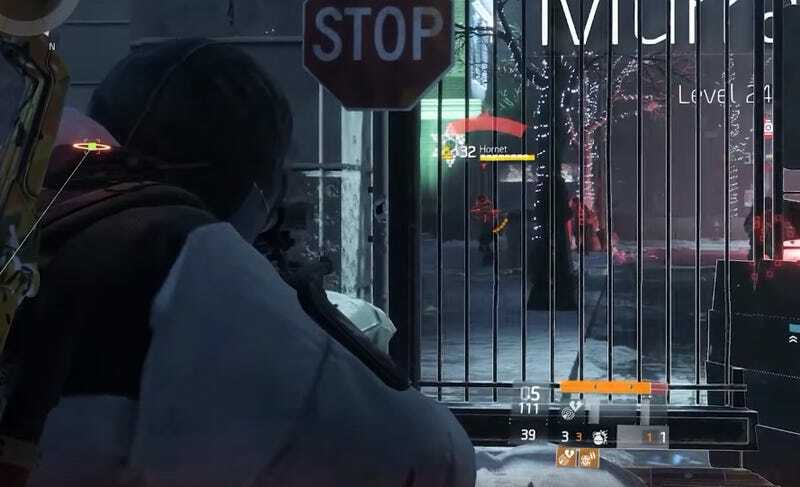 The Bullet King may be dead, but that doesn’t mean The Division players have been unable to find new farming strategies to exploit. The latest popular strategy is about as elaborate an approach as I’ve seen. Get a full team of high-level friends and start the Russian Consulate level on Challenging difficulty. Make sure your scavenging stat is as high as you can get it. Fight all the way to the final battle in the courtyard. When you get to the courtyard, kill the first few enemies without going out into the courtyard. (Watch the video to make sure you don’t screw this part up, it’s at around 1:00). After that, three players backtrack all the way out to the street looking in on the courtyard while one player stays behind. The players outside set up mobile cover in a certain way, which lets them pass through the fence and into the courtyard. The inside player runs through the courtyard to the mobile cover the other players set up, passing back out and onto the street. The battle continues inside the courtyard. Everyone brings down the named boss, Hornet. One player walks up to the fence while the others stay back. That player dies, which tells the game that everyone in the instance died. The battle will reset and that player will warp back inside. Rinse and repeat: Run through, kill the boss, one player dies, do it again. With the increased challenge mode drop rates, you should amass a tidy collection of specialized and high-end gear in not too much time. I’ve yet to try this method myself, but I admire the approach mostly for how involved it is. The Division is currently hurting a bit for endgame content, so players have been getting more and more creative in finding ways to maximize the rewards for their effort. It’s almost certainly not the most fun way to play the game, but in some ways it depends on your definition of “fun.” It sure seems like it’ll get you a lot of high-end gear, anyway. I kind of want to put a team together just to say we did it.